Together with Picasso, the French painter Georges Braque wrote one of the most significant chapters in modern art history: the invention of Cubism. He started out by learning the trade of painter and decorator in Le Havre, following the family tradition. In 1900 he moved from Normandy to Paris, where he studied for a time at the Académie Humbert alongside Francis Picabia and Marie Laurencin, and made his debut as a landscape painter. In the French capital he had the opportunity to view the work of André Derain and Henri Matisse at the Salon d’Automne in 1905. He spent the summer of 1906 in Antwerp with Othon Friesz, and that autumn he headed for L’Estaque, following in Cézanne’s footprints. There his palette became progressively brighter due to the influence of the young Fauves, with whom he exhibited at the Salon des Indépendants in 1907. That year he met the dealer Daniel-Henry Kahnweiler and Guillaume Apollinaire introduced him to Pablo Picasso. Viewing Les Demoiselles d’Avignon caused his painting to take a new turn. 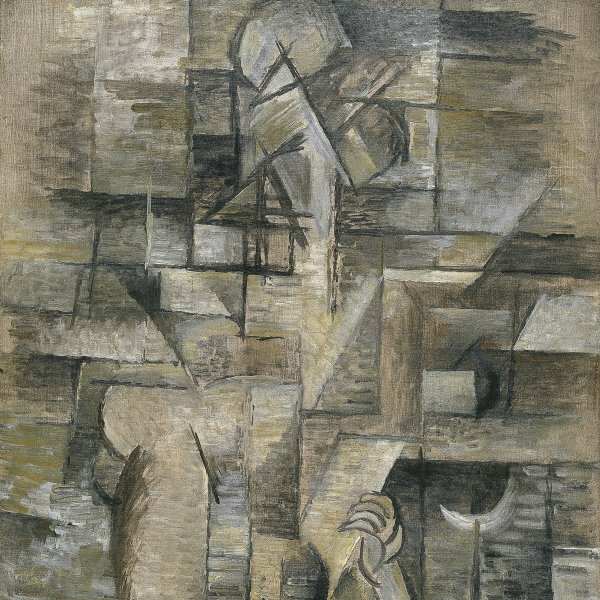 From then until 1914, Picasso and Braque worked in close collaboration and laid the groundwork for the new Cubist language. 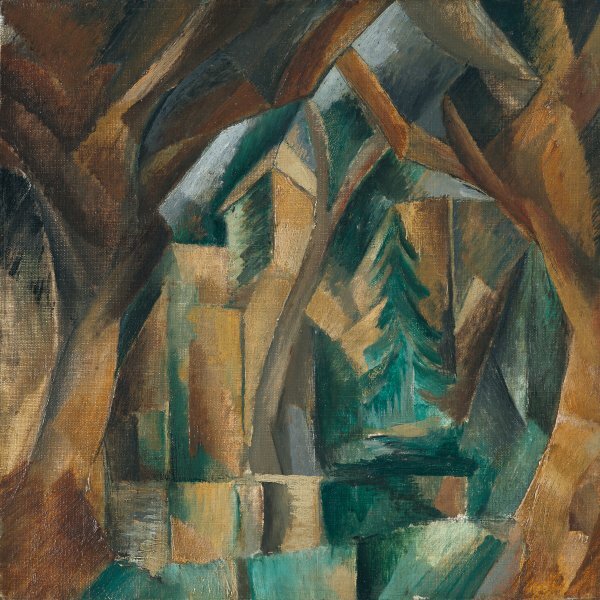 Towards 1912, in an attempt to avoid the loss of contact with the visible world into which Cubism had evolved, Braque began to paint certain areas in trompe l’oeil fashion, imitating marble or wood, and returning to the trade of house painter and decorator he had learned from his father. He later went one step further by pasting labels, pieces of wallpaper and real newspaper cuttings onto his compositions. These papiers collés became another of the revolutionary novelties Braque and Picasso introduced into modern art. Braque fought in the war and, like Apollinaire, suffered a head wound, although without the tragic consequences of his friend. He remained faithful to the Cubist aesthetic until the 1940s, though he now favoured much softer forms and colours. His Atelier pictures, the centrepieces of his output during the final years, summarised his favourite themes and marked one of the decisive moments in his career.